Coming up on Friday, November 22 at 6:00 pm, there will be a reading and lecture event in the Crowley Theater Annex located in between Marfa Book Company and Marfa Public Radio in the old St. George Hotel building on Highland Avenue. This event is presented by the Marfa Book Company and Chinati Foundation. The reading will be given by Clark Coolidge, an American poet. Born and raised in Providence, Rhode Island, Coolidge is both an experimental poet and a jazz musician. He attended Brown University and moved to New York City in the early 1960s. He has been associated with the Language School and the New York School. His work utilizes syntactical and sonic patterns to engage and generate meaning. He noted in a 1968 poetics statement, “Words have a universe of qualities other than those of descriptive relation: Hardness, Density, Sound-shape, Vector-force, and Degrees of Transparency/Opacity”. For fifty years, Coolidge has been publishing books that have challenged and even changed our ideas of what a poem is. He is working in an experimental tradition similar to Gertrude Stein, Louis Zukofsky, and Jack Kerouac. 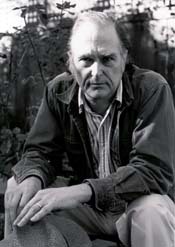 His numerous collections of poetry include; This Time We Are Both (2010); Sound as Thought (1990), which was chosen for the New American Poetry Series; Own Face (1978); Flag Flutter and U.S. Electric (1966). He is also known for his collaborations with visual artists and musicians, including the painter Philip Guston, the Quartet, and most recently with Thurston Moore (of Sonic Youth). Everyone is invited for this event with Mr. Coolidge and admission is free. The Theater is located on 340 acres of land on the site of former Fort D.A. Russell in Marfa, Texas and sponsors art and education programs establishing close links to the local community and other cultural institutions and universities in the United States and abroad. The Marfa Book Company is a bookstore, publisher, art gallery, film, music, and performance space and is located at 105 South Highland, Marfa, Texas. This establishment focuses on art, architecture, design, and poetry titles but also carries a large number of Texas Regional, fiction, philosophy, and history titles. It also has a small Children’s Book section, and a good selection of magazines. This entry was posted in Marfa, Marfa Texas, TX and tagged Cibolo Creek Ranch, Cibolo Creek Ranch Luxury Resort, Clark Coolidge, Crowley Theater Annex, Marfa Book Company, Marfa Lecture, Marfa Reading, Marfa Texas, Texas, Texas Luxury Resort, Travel. Bookmark the permalink.